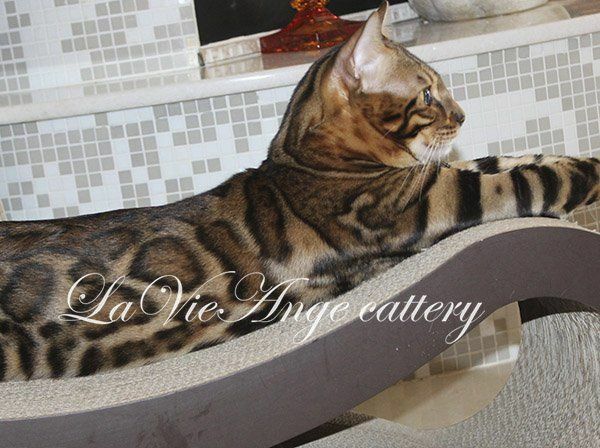 We are glad to welcome you on our website, which is dedicated to the Bengal cat NYC, the most amazing cat breed. LaVieAnge is a small family cattery located in Brooklyn, New York. Though small, we are proud of the conditions our cats are kept in and the care they receive. The immaculate beauty of Bengal cats, which are so gracious yet so rare, inspired the idea of a cattery. The history of our cattery in New York began in 2011, when we acquired a pair of champion cats. To ensure that we provide the best Bengal kittens in NY, we chose the best Bengal cats that we could find for our cattery, the focus being to achieve perfection in every kitten. Stunning male kitten, amazing color, contrast, classic rosettes. 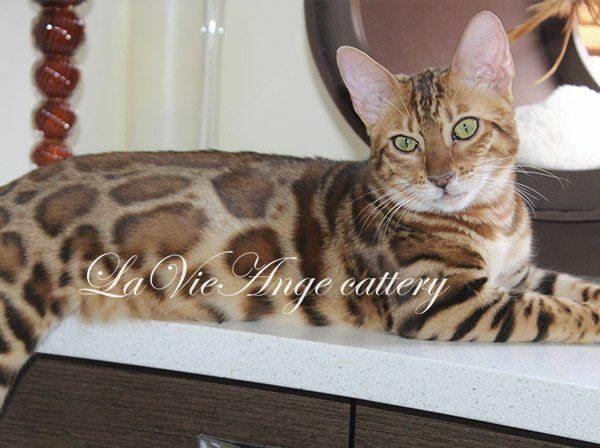 Our cattery LaVieAnge is registered with the international organization TICA (# 29051). We breed SBT Bengals (who originated from Asian leopard cats). Our purebred kittens are simply flawless. Each one has incredible leopard-patterned coat and a muscular athletic body. The Bengal kittens inherited a strong character from their wild ancestors, but are known for their friendly and playful nature. They are very social and intelligent, and are a striking combination of a wildlife independence and fondness. We are a very passionate Bengal cat breeder. We constantly study and learn various information about Bengal cats. To succeed in such area, you need to put the animal above all. We create the most comfortable conditions for our pets. We do not keep animals in cages; they live in a friendly family atmosphere. Every day we pay special attention to each pet. After all, it is very important for them to feel love, care and attention. All our animals eat the right food and drink fresh bottled water. Special balanced cat food is reach with nutritive ingredients and does not contain corn or wheat. Potatoes and all kinds of beans are strictly prohibited, as they are very difficult to digest and may cause problems such as diabetes. Good ingredients are organic turkey, chicken and prawns. Artificial colors and preservatives are excluded. They have no nutritional value and are harmful to the immune system of an animal, especially Bengal cats. All our animals eat Royal Canin Dy specialized food and moist food. Our slogan is: “No carcinogens!" Our our Bengal kittens for sale ny are vaccinated according to the schedule and are regularly examined by the best certified vets. All cats have negative tests for PK Def and PRA. Improved good nutrition and the absence of unnecessary vaccinations is the key to success! These conditions must be met at all times. Bengal kittens are a great gift for everyone, they are part of the wildlife in your home and great home companions. For additional information or further inquiries as for availability, please contact: +1 (718) 808-3690.